Many timber frame homes have private access; here's what you need to know to keep the peace with neighbors and ensure your road is up to code. Sharing a private road with your neighbors can strain the best of friendships. Simmering anger over road maintenance can lead to shouting matches at neighborhood meetings or legal action. In one extreme case in rural Colorado, tensions ran so high that neighbors threatened neighbors at gunpoint. Hatfield and McCoy-type showdowns are rare, real estate experts say, but to avoid bad feelings — much less potential lawsuits — it is critical to understand what you're getting into when you buy land accessed by a shared, private road. "It's all about informed decisions," says Bonnie Pickartz, who co-owns Goshen Timber Frames with her husband, David, in Franklin, North Carolina. "Whether you're building in Colorado, California or the Carolinas, you have to look at the roads. "Roads are so important, not only for your access but from an emergency standpoint. Owners think just because they can get their four-wheel drive in there, it's OK, but if there is inclement weather or there is a fire or health emergency, they can't always get in." The issue should be top of mind for any consumer thinking of having a house built because private roads have become increasingly common across the country in the last 20 years, in developments large and small, in rural, suburban and urban areas, says Roger Winston, a real estate attorney with the Bethesda, Maryland, firm of Ballard Spahr Andrews & Ingersoll. "Municipalities across the country are less and less inclined to take responsibility for new roads," he says. The major reason why? Money, or lack thereof. Municipalities, in general, have resisted taking on the financial burden of new roads, which most often are not built to local department of transportation standards, particularly in areas where growth has fueled residential building booms. In other cases, residents themselves prefer a private road because it connotes exclusivity or, at least, provides a certain amount of seclusion. Sometimes the reasons are simply aesthetic. You're even more likely to encounter private roads if you're looking at timber frame construction. These types of houses often are built in rural areas or in developments with large lots on land accessed by private roads, timber frame builders say. "We build very few homes in areas that are maintained by the local department of transportation. We've done five out of 300 in the last 10 years," says Bonnie. "Most timber frame homeowners do build in subdivisions that are accessed by private roads." It all starts with access. If you can't get to a piece of property — either for lack of an adequate or legally recorded easement or because the terrain prohibits a cost-effective, practical way to put in a road — it's not the place for your dream home. 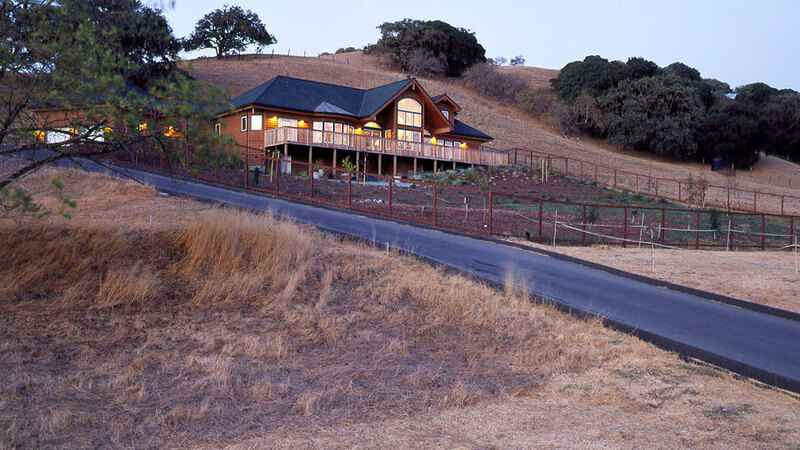 As you look at property, you may run across lots with easements. An easement can serve as a legal right of way that allows for the establishment of a shared private road. It's critical to understand the scope of an easement — who has access to the road and who is responsible for maintaining it. Who has access into the development and the lot I want to buy? Is there an existing road that provides access? What will the finished road look like? Is there a road maintenance agreement? How detailed is the agreement? • Is there a reserve account designated to hold funds to pay for future maintenance and repair? How much will it cost each landowner to maintain the road? Do the residents adhere to the agreement? Is there a legal remedy, such as the ability to file a lien, if residents don't adhere to the agreement? "The ordinary development, unless you have some scum who's doing it, will have provisions related to road maintenance," says Richard E. Glaze, a real estate attorney in Winston-Salem, North Carolina. "If there is no provision for maintenance, you're in trouble." It's important to discuss your preferences with neighbors who will share your road. It's a community resource, so everyone should be involved. David Plott, an engineer and former public planning specialist-turned consultant, suggests that neighbors in situations without a formal maintenance agreement rally together to find common ground and to recognize that a high-quality road is going to increase everyone's property values. "Have a big block party and bring it up," he says. "I emphasize the all part of it. It needs to be everybody." The most common means for stipulating the details of a shared road maintenance agreement — or any group amenities, such as a swimming pool, club house or walking trail — is a homeowner association, ideally set up in advance by the developer. An HOA should have detailed covenants or bylaws that address any significant issues. "You want to create this document before anybody moves in, when the developer has full control, so it's fair and equal for everyone," Richard Glaze says. "There are a host of different considerations. In general, the more detail the better." Cost-sharing typically is split evenly among the landowners, although that isn't always the case. In some neighborhoods, for example, the owner who lives farthest down the road or who has the largest lot, pays the most. The circumstances related to the maintenance of a shared private road certainly can vary. In another case, in Vermont, the developer who oversaw the maintenance of the private road into his development died unexpectedly. He had laid out basic rules for sharing in the maintenance of the hilly, gravel road — named, appropriately enough, Havoc Hill — but with no specifics. There wasn't, and still isn't, a homeowners association. No road maintenance agreement. No details to guide the four owners who are responsible for the road, which is less than a mile long. "Then he passed away, so it was just us," says one of the homeowners who asked to remain anonymous for fear of angering her neighbors. "When it's a money issue, it gets sticky because there is nothing formal," she says. It is difficult, not surprisingly, to get a group of homeowners to agree how a road should be maintained when there is no guiding, legally binding document to dictate the terms. Some folks want gravel. Others prefer pavement. "Real Vermonters just drive over the grass until it's worn out," says Patti Komline, another, unrelated homeowner on a private road in Vermont. "It's really weird to see a paved road in Vermont."